Where you are in the program? First meeting is September 20 in CdC 20 at 5pm, there will be pizza! Discussed our two community projects, the WARM Journal digitization project, and the MCBA postal art and stamp collection project, and the upcoming Archives 101 panel on October 9th at 6pm in Whitby 101. Panelists have been confirmed. Also have panelists confirmed for a December 2nd brown-bag lunch round table of new professionals between classes. Locations TBD. TCART Symposium is in November. Considering a tour of the Walker library & Archives. Will need to hold special elections for our graduating Co-Chair, Zach Jansen, & Secretary, David Norris, in November. Working with ALA for Banned Books week. Will have table at fall MLA Conference in Rochester. Little Free Libraries are doing well. Previous PLG leaders installed two LFLs on campus: on Randall by gate and outside Butler Center. PLG keeps them nice and filled. Will need a librarian student to take over stocking the LFLs and other officer positions. First meeting: September 27 at 5pm in CdC 5. There will be pizza! PLG is part of a larger organization and this chapter may be the only student chapter. PLG does a lot of outreach to the community such as a school supply drive. Done! Met with Tuesday class and still scheduling the Friday class meeting. Peer-to-peer Mentor Program: Heather Carroll will send a mentee invitation email to all students with 12 credits or less and a mentor invitation email to all students with more than 12 credits (in house credits, rather than transfer credits). We invite professional members of the library community to attend and mingle with students, such as TCART, ITEM, MLA, etc. ePortfolio panel/workshop 7pm in room 102 in the VAB (9/18/17). David Norris, who spearheaded this event with SAA last year, has agreed to Emcee with this event. The general expectations of SGO – since we are student run, there are not any department restrictions placed on us. We work together with the LIS department. SGO represents the voice of the student body. How do we envision that working? Reaccreditation expectations of student group leaders – students will be asked to participate and meet with the accreditation board. Details are not known at this time, but will be posted when available. When we know, we’ll let you know. There may be email surveys, townhalls, or randomly selected students to be at more intimate meetings. It is just not known at this time. The reason for the visit is to verify that what the department submitted to the board is accurate. It’s not a chance to only show a glowing happy-face with no issues. They want to hear honest feedback and constructive criticism from the students. Starting this fall, Dr Molaro will schedule coffee chats as a chance for students to talk directly with him about anything. There would be in-person and virtual meetings to accommodate students who can’t attend the in-person. GSAB representation – update who can be a rep? Faculty Development – Faculty Chair is Dr. Dahlen. Student Services – Faculty Chair is Dr. Lesniaski. Wendy Dickman is current rep, but will be graduating mid-year so a replacement will need to be recruited in the spring of 2018. Facilities – Faculty Chair is Dr. Yoon. Curriculum – Faculty Chair is Dr. Yukawa. Deb Eschweiler is current rep, will be stepping down if replacement can be recruited in Fall 2017. 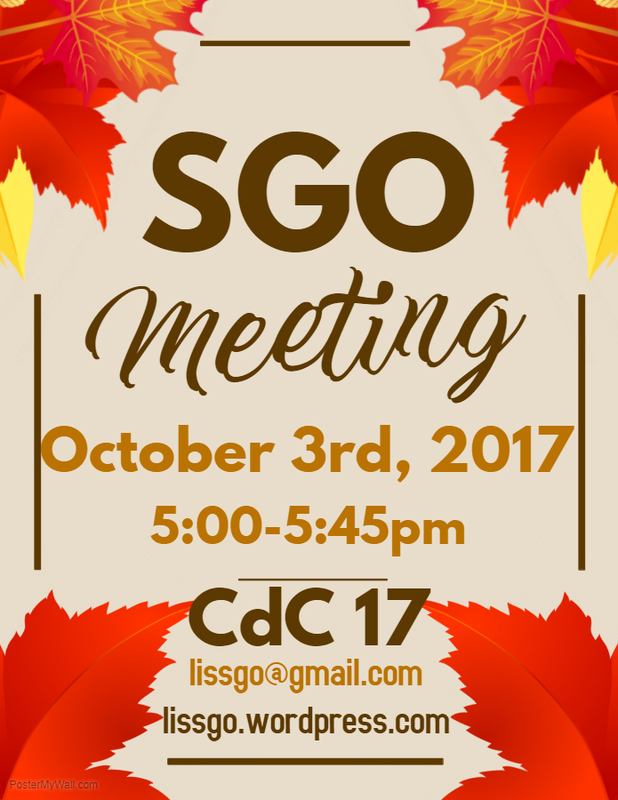 GSAB – First meeting is Sept 20th. GSAB has requested that all student groups have a representative. Kallie Schell has contacted Deb E and has identified herself as the PLG rep for GSAB. SAA and SLA are already represented by the current reps. We need to recruit an ALA rep! They ALWAYS have excellent food! Trish will add language to the “get funding” section of SGO website relating to this.